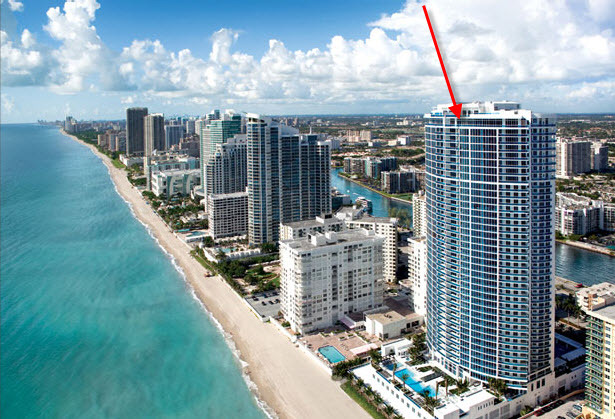 Trump Hollywood is a direct Oceanfront Condo on Hollywood Beach that offers Luxury Amenities and spacious 2-6 Bedroom Residences with 2,088 – 8,926 Square Feet of Living Area and beautiful views of the Ocean, Intracoastal, Coastline, Intracoastal, and City. Residences at Trump Hollywood range in size from 2-5 Bedrooms with 2,100 to more than 5,000 square feet, plus expansive Terraces. Two exclusive bi-level penthouse residences on the tower’s 41st floor encompass nearly 9,000 square feet. The views, Luxury Amenities, location, contemporary design, Floor-to-Ceiling Glass Windows, and Units ranging in size from 2,100 Square Feet to nearly 9,000 Square Feet Penthouses make Trump Hollywood a great choice to consider. Residences start on the 5th Floor of the Building and go up to the 41st and 42nd Floors, where 2 Bi-level Penthouses are located. Units on the 5th – 33rd Floors have 9′ Ceilings and there are 6 Units per Floor on Floors 5 – 33. Units on the 34th – 40th Floors have 10′ Ceilings and there are 4 Units per Floor on Floors 34 – 40. Interested in Hollywood Luxury Condos or Hollywood Oceanfront Condos? Trump Hollywood is a great choice to consider! Trump Hollywood Condo is located conveniently close to Shops, Restaurants, Aventura Mall, Bal Harbour Shops, Cultural activities, Nightlife, Seminole Hard Rock Hollywood, FTL-Hollywood International Airport, The Village at Gulfstream Park Shops + Casino + Restaurants, Sports Venues, Marinas, the future Hollywood Margaritaville, Ft. Lauderdale, Miami Beach, and more!